Le Brasserie des Étangs has it all in the name: an upmarket brasserie served by efficient black-and-white-clad waiters and surrounded by large ponds (Étangs) and greenery. This restaurant exploits one of the strong points of Brussels: the large number of parks in the heart of the city. 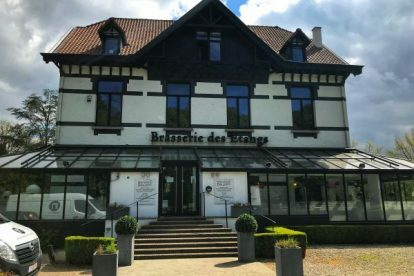 The Brasserie is just on the edge of Park de Woluwe, which makes it very easily accessible by public transport and vehicles, while having the eating area overlooking a sizeable garden, bordering the park. In the garden there’s also a large outdoor children’s playground, making it an ideal place for families. With a kitchen that runs pretty much for 11 or 12 hours per day straight, I find this restaurant convenient not only for lunch and dinner but also for a snack or afternoon tea (gouter in French). It is also one of the few restaurants I know with an entire salon designated as “fumoir” (smoking room), although I don’t smoke myself. One last thing: when you go the bathroom be on the lookout for the witty anecdotes that cover the walls -at least in the men’s!